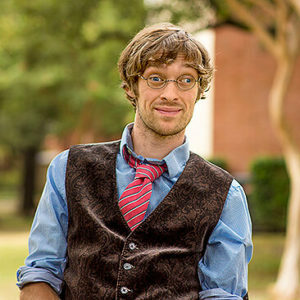 I first found Zach Anner, a comedian with cerebral palsy, when a friend shared one of Zach's "Workout Wednesday" videos to Facebook. I started laughing so hard, tears were running down my face, and before the clip had ended I sent it to my mom and binge-watched as many as I could for the next hour. Months later, BraunAbility is happy to announce a partnership with Zach and we are excited to see where his rising career goes next. Zach first rose to stardom with a video submission to Oprah Winfrey's "Search for the Next TV Star" competition. He ended up winning the competition, thanks in part to the support of the Reddit community who helped his audition video go viral, and OWN produced six episodes of "Rollin' With Zach" in 2011, with a theme song produced by John Mayer. He then turned to YouTube and started producing "Riding Shotgun," a travel series showing the ups and downs of travel with a disability. He also hosted "Have A Little Faith," a show with a more or less clueless Zach having a faith-related dialogue with religious believers, for Rainn Wilson's SoulPancake (a media company you may recognize as having produced Kid President). Now, he's written his first book, "If at Birth You Don't Succeed: My Adventures with Disaster and Destiny." He tells the story of his life thus far, and discusses important issues in the entertainment industry, the disability community, and life itself - in a thoughtful way without becoming self-righteous. Zach says, "I never expected to be a disability advocate. I was a comedian first, a storyteller second, and probably a connoisseur of fine bathrooms third. 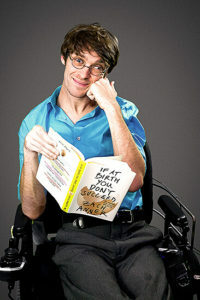 But in that audition video I jokingly stated that 'I have cerebral palsy, which I believe is the sexiest of the palsies.' The line caught on...I was surprised to find that that little phrase was starting to change perceptions...(people's) first thought (when seeing someone with a disability) was not one of pity but of recognition...like that person was somebody he could imagine grabbing a beer with." And what he's managed to do, and continues to do, is to carve out a new way of talking about disability. Zach writes about his challenges in backpacking literally on his friend's backs through a forest, like Yoda on Luke Skywalker - in the same hysterical way as his adventure with his childhood friend to run away to New York and marry Cindy Crawford. Nothing is off-limits, and the book comes across as part soul-baring journal and part stand-up routine. While reading about Zach and his friend's trip to see the Endeavour launch from Cape Canaveral and his commentary about heading to the moon, I was reminded of Ralph Braun's book, "Rise Above." In it, Ralph talks about his "Moon Shot" at a time when the country had its eyes set on one of the most ambitious goals in history. "If even the sky itself was not the limit," he writes, "what did the future hold for us? When Kennedy gave his speech in 1961, most people my age were concerned with what they were going to be when they grew up. My concern was that I wanted to grow up, period. Staying alive was my moon shot." Now, years after Ralph's book, Zach talks about the U.S.'s crazy dream of heading to the moon. "We promised to go to space within two years at a time when computers were the size of rooms and less powerful than a graphing calculator. We went to space back when doctors suggested that if you're pregnant, you should keep smoking so as not to stress yourself out. We hadn't even invented the technology we needed to get to space and we gave ourselves a hard deadline and stuck to it...Hearing (Kennedy's speech) helped me realize that witnessing Endeavour would not just be the grand finale of a cool road trip with friends, but would also honor an era in our country's history, a time when we resolved to make the impossible possible and kept that promise despite the improbability of success." 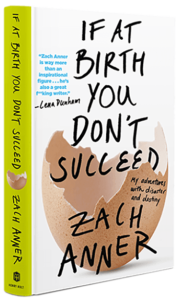 Keep up to date with the AbilityVoice blog and our Facebook page to see more from Zach in the coming months.Also be sure to check out his book and subscribe to his channel!